ahutton@ahutton.com We have some great pricing for both end users and wholesale to resellers on flat magnet strip, rolls and sheets. We have magnet that you can print by Screen, UV, solvent and eco solvent inks or We can print it, laminate with dry erase and cut to size. 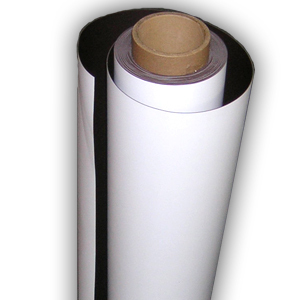 We also stock plain magnets that are not printable and have a pressure sensitive back. We have sold tens of thousands of printed dry erase magnets. We can do sizes from a 1" circle to 48"x10 ft scheduling layout. We can combine thousands of names and titles and have them produced with different background colors. In Short ...... Call us for a magnet quote if its one piece or 10,000. Magnetic Sheets, Strips, Rolls. label holders from 1/4" to 48". Wide range of materials available in different thickness's, roll widths and surface treatments from pressure sensitive to printable vinyl. We have some great pricing for both end users and wholesale to resellers. Let us Quote You!